An exclusive destination for international as well as global summits and a wonderland for leisure guests with its breathtaking landscape and various outdoor activities re-opens on 17 May 2017 . Being an integrated part of the destination, Sunrise Kempinski Hotel, Beijing & Yanqi Island, facilities on Yanqi Island include Yanqi Hotel with a private marina which features 110 guestrooms and four F&B restaurants and bars, 8,277 sq m Beijing International Conference Centre, 12 Boutique Hotels with a total of 178 guestrooms and Yanqi Pagoda. As the official host venue for APEC China in 2014, Understanding China in 2015, G20 Science, Technology and Innovation Ministers Meeting in 2016, Belt and Road forum in 2017, Yanqi Island will officially re-open to the public on 17 May, 2017 . To celebrate the re-opening, enjoy 15% off the best available rate in a Grand Deluxe Room at Yanqi Hotel from 17 — 31 May, 2017 including breakfast for two at Waterside. To book, please visitwww.kempinski.com . 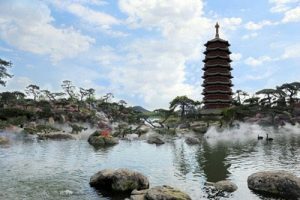 The Summer Garden is an exquisite ensemble of ponds, hills, waterfalls and a pagoda at Yanqi Island; it covers an expanse of 40,000 sq m, three-quarters of which is water. The natural landscape of hills and open water is combined with artificial features such as waterfalls, ponds and bridges to form a harmonious ensemble of outstanding aesthetic value. As the breeze flutters, waves gleam and willows kiss the ripples of the vast water, the highlights can’t be left out of any delightful scenery above. The design of Yanqi Hotel is inspired by the Chinese philosophy “Man-Nature” coordination and the value of modern China : China -world interaction. The mountain view from the guestrooms and the view “looking out” to the marina show an intimate interaction with the natural surroundings. From the roof and the wall to the inside yard, the traditional Chinese courtyard concept plays into all the details to enhance the guest experience of space, a ray of light and the most coalescing of Yanqi Lake. The Beijing Yanqi Lake International Conference Centre’s architecture draws inspiration from the Han and Tang Dynasties, and the blue roof symbolises the “Temple of Heaven” (Qi Nian Dian). The conference centre spans 8,277 sq m with ample outdoor event space amidst beautifully landscaped natural gardens. The 12 Boutique Hotels with a total of 178 guestrooms and suites are located on various parts of Yanqi Island. The Boutique Hotels range in size from 6,000 to 9,000 sq m and house between 10 and 19 guestrooms in each building. Guestrooms range from a 40 sq m Standard Room to a 1,087 sq m Presidential Suite. Each hotel has an indoor swimming pool, fully equipped gymnasium, games room, library, meeting rooms and spa treatment rooms. Chefs are also onsite to delight guests with their culinary creations in the private dining room. Set in 3,197 sq m (34,412.2 sq ft) grounds, the Yanqi Pagoda is 60 m (196.9 ft) high and has nine floors. Pagodas play a very special part in China’s cultural and architectural history. There are two types of pagodas that are categorised by function — fengshui and for viewing. The Yanqi Pagoda combines these two functional elements, providing both a fengshui pagoda for Yanqi Island and a viewing gallery forYanqi Lake .